Butterflies are welcome guests in almost any garden. They light on a flower just long enough for us to stop and stare, adding a dimension of beauty that makes the world feel complete. Once you learn how easy it is to attract butterflies, gardening for their benefit becomes downright addictive. Butterfly gardens come in all shapes and sizes, and they provide an endless source of learning opportunities. Plant one in your yard or at a school, and you’ll have real-life teaching tools on everything from pollination to the life-cycle of plants and animals. Butterfly gardens are also vital to the conservation of Native plants and the butterflies that rely on them. There are just a few things to keep in mind before getting started. Butterflies require different plants for different stages of their life-cycle. Each butterfly species has a preferred host plant on which they’ll lay their eggs. The host plant provides protection and food for newly-hatched caterpillars. Caterpillars form a chrysalis after gobbling up an astounding amount of their host plant. Inside the chrysalis, the amazing metamorphosis from larva to adult butterfly takes place. Adult butterflies seek nectar from many sources, including Buddleia, Hollyhock, Aster, Coreopsis, Parsley, Fennel, Coneflower, and Goldenrod, just to name a few. Most butterfly host and nectar plants are Native, which means they’re well-suited to conditions in our own backyards. Once established, they need little maintenance. Because each butterfly species has favorite host and nectar sources, it’s best to do a little research before planting. Monarch Watch and The Butterfly Site offer information on what to plant to attract specific butterflies. Local garden centers are also a good source of information. Good books on the subject are Butterfly Gardening: Creating Summer Magic in Your Garden and Attracting Native Pollinators: The Xerces Society Guide to Conserving North American Bees and Butterflies and Their Habitat. Many of the Native plants butterflies prefer are in decline, due to development and herbicides. The Monarch butterfly was near extinction for a time, due to depletion of Milkweed. Butterfly gardeners helped revive the Monarch population by planting Milkweed along their migration route. Monarchs are the only butterflies to migrate. They make a truly amazing voyage from Canada to Mexico, and back again, each year. We have much to learn from them, and from our own impact on our shared environment. 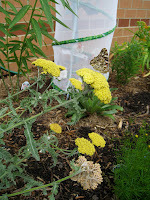 Our school butterfly garden is a little spot of color and wonder for passers by, as well as those who wish to linger.